The Netherlands have a lot to offer for the curious visitor. Many of its highlights are included in our regular tours. However, there are many more wonderful things to see in our country. Our group of dedicated professionals will be able to "tailor" the right itinerary for you according to your interests and wishes. The following are some of our favorite "special interest tours" which we have conducted through the years. These are just some examples of possible themes and some less known destinations which we would like to recommend. Experience the magical and festive holiday atmosphere in Maastricht and visit the village of Valkenburg, Famous for its underground Christmas markets. Vincent Willem van Gogh is no doubt one of the world’s most known and beloved artists. Many people have a vague idea about Van Gogh’s turbulent years in France when he created his most famous works. Just over one hour drive from Amsterdam lies the National Park De Hoge Veluwe. It is the largest lowland nature reserve in northwest Europe. Alkmaar has become known as Holland’s foremost cheese town. During the season (from the first Friday in April until the first Friday in September), there is a traditional Cheese Market every Friday morning. Naarden is one of the best preserved fortified cities in Europe. It is famous for its unique star shape fortifications. The fortress has six bastions, double walls and double canals. Count Floris V built this stone castle at the mouth of the river Vecht back in 1280. 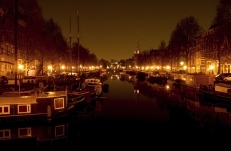 The River was the trade route to Utrecht, one of the most important trade towns of that age. The farms were built along a narrow road through a swamp, thus becoming the 10- kilometers long village of Staphorst-Rouveen. The farms are of the traditional Low Saxon type. This well-preserved, medieval fishing village, has kept the characteristics of its 13th’ century design. Since the close of the Zuiderzee (Southern Sea) in the 1930’s fishing stopped being a viable source of income.